Masahiro Ito, Silent Hill series art director, continues to give us the goods on the soon to be released Pyramid Head figure by Gecco. Not only is the figure a work of art, but the packaging is equally impressive. I don’t even want to open it now. 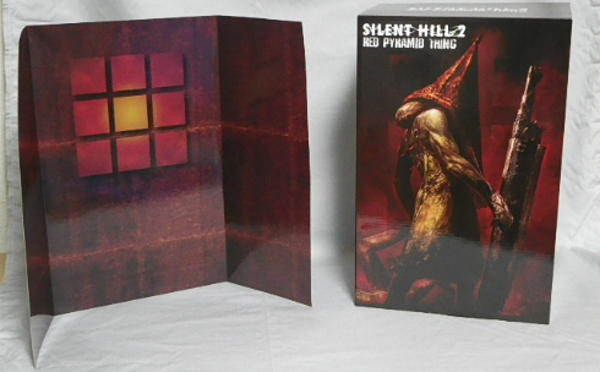 The figure will be wrapped in original artwork by Ito-san and provide us with a backdrop for the figure that reference Silent Hill 2‘s iconic square symbol that’s on the Japanese box art for the game. The box art is astounding and provides us with a sample of the freshly revived features of our pal Pyramid Head. The figure is set to be distributed by ToyMunkey in the U.S. later this month. Can we review figures? I think I’ll review it. So fine. So smooth.